Schubert’s connection to sacred music originated during his youth, when he sang as an eleven-year-old soprano soloist in the Lichtenthal Church in Vienna and later also contributed compositions for mass, as well as other sacred works for worship services. On the other hand the Mass in E flat major D 950 is among Schubert’s last completed works. It was composed in 1828, probably for the Trinity Church in Vienna, Alsergrund. Like many of Schuberts works on a large scale, it was largely forgotten after his death and was only rediscovered on the initiative of Johannes Brahms in 1865. 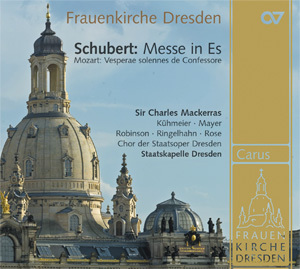 Sir Charles Mackerras conducted the Mass with the Staatskapelle Dresden in this recording for his belated debut at the Dresdner Faruenkriche with renowned soloists, including Genia Kühmeier und Matthew Rose. Mozart’s equally-beloved Vesperae solennes de confessore KV 339, with the famous „Laudate Dominum“ completes this recording and it is much more than just a supplement to Schubert’s Masse – it points towards the roots of Schubert’s sacred music. The booklet contains an in-depth interview with Sir Charles Macherras.